As a journalist, I feel relieved to have been spared this level of ruthless examination. But as a spectator, I find Rogers's perspicacity delicious. That’s not to say that Rogers doesn’t have fears. After all, to her, fame and the whirlwind that comes with it are still brand new. 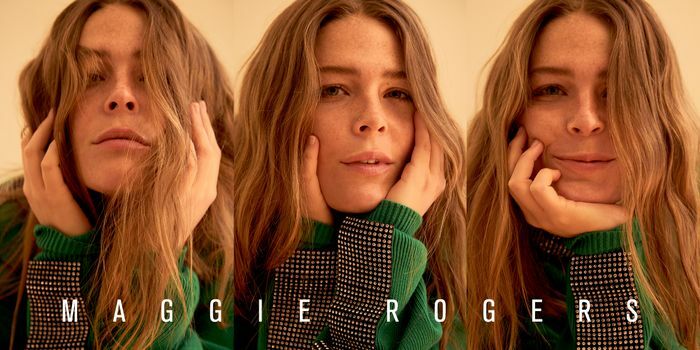 Below, read Rogers speak in her own words about self-care in the wake of stardom, her creative process, and her quirky style evolution. “Self-care has become really important to me on the road. It just seems like establishing self-care routines is a part of being this age. I’m having a very unique experience [with my career]. But at the same time, whenever I talk to my peers—friends from college or high school—I realize what I’m going through is actually really normal 25-year-old stuff. It just looks different. I’m in this touring grind, but all my friends are in med school and law school. They’re building their lives, too. I think everybody my age is just in this space of working, figuring things out through the work and dedicating themselves to something in order to grow. “Part of self-care for me is that I’ve started becoming more purposeful about professional handshakes. It’s something I realized specifically on my tour with Mumford & Sons—because nobody hugs Marcus Mumford, but everybody hugs me. And by everybody, I mean people I interact with professionally—photographers, journalists, people at radio stations. People want to hug me. And I know it’s because I’m little and I write about my feelings and I’m a woman. But a big thing for me has been finding boundaries. What are the things I save for my friends and family? Because I’m already sharing so much. “I’m just trying to figure out ways to separate my personal and professional life. I have to ask myself what right have I given people to my intimacy because they’ve listened to my music? The reality is that my personal and professional lives fall in this sort of messy blurred Venn diagram. Because my professional life is my personal life; the two are very on top of each other. Plus there’s a third element, which is the romanticism of what I do. There are elements of [making music] that feel like work, but the reality is that I get to do this thing that I love more than anything and call it my job. So I’m trying to figure out: Where are my boundaries? Where is my comfort level? That’s been the biggest thing that I’ve been focusing on over the last year or so. Because I want to stay fun, stay loose, stay young. It’s tricky to navigate. But as [my career] continues to grow, the one thought that I keep coming back to is that there’s so much out of my control. “Trying to figure out my relationship to performing is an ever-evolving thing. Writing and performing are definitely two very different energetic expressions, and they take very different lifestyles. I’m definitely way more creatively fulfilled when I’m writing—it’s where my heart is. But it gets really difficult on the road because something that’s really important to me when I’m writing is having a consistent space. I live on a bus with 12 people right now. “So I don’t write a ton on the road because there’s not a lot of private space. And the thing about my work is that it’s super vulnerable. I’ve been thinking a lot about social media and the daily asks in my life, and I think whether I’m on the road or off the road, there’s just a lot of overstimulation. So I’m trying to move at a slower pace. Writing is my way of processing. But it takes a bit of time to have some sort of reflection in order to do it. “The record [Heard It in a Past Life] is so powerfully an expression of me reflecting on this past year and a half in my life when everything changed. I’ve got a little studio in a barn by my parents’ house in rural Maryland, and that’s a really nice place to write because it’s quiet and I can be outside of things and take my time. My grandmother’s piano is in that studio. “Style onstage has been this constantly fluctuating question. At the beginning of my career, I was working with this incredible designer named Christian Joy. Christian designed all the suits for Karen O and Brittany Howard from Alabama Shakes. She makes these incredible costumes. In the beginning, Christian and I were making these Matisse cutout–inspired jumpsuits and capes, and I think the reality of that was I was really scared, and it was helpful to have this colorful, fun, mystical suit of armor to wear every night. Then I think I got to a place where I was comfortable, and I wanted to pare down and feel a little bit more like me in my daily life, so I started wearing T-shirts onstage. “But I think the reality is that onstage, no matter what you wear, it becomes a costume to some degree. So suddenly the clothes I was wearing in my daily life felt like a costume, which was really confusing. Now I’ve sort of landed on a hybrid, but [deciding] what to wear on stage is not something I feel like I’ve figured out yet. Now I have this crazy silver shirt that I bought in a thrift store in Kansas City and these red boots that I bought at a thrift store in L.A. Another outfit I’ve been rotating on this tour that’s super silly and fun is this velvet zebra two-piece that somehow I only wear on Friday nights in French-speaking [cities]—Paris and Montréal. Just when I feel like I need a little something extra. “Offstage, I’m really a jeans-and–T-shirt gal. I sort of live in this pair of steel-toed boots that I can’t get enough of. Although right now we’re in Birmingham and I’m wearing a dress, which feels very fun because I’m not really a dress girl. I normally wear a lot of tie-dye and denim. I love clothes that make me feel like I have movement and can make things in them. “I like feeling like a working artist—having raw fabrics and open sleeves and waists. Not baggy; just flowing. I care about economy of movement. But I also love pairing that with something fun—a little bit of glitter eye shadow, maybe. I always say that my personal style is a combination of a space cowgirl and a San Francisco art teacher. I have this style alter ego that my friends call ‘your mom’s cool friend from pottery’—like a kaftan and something fringed and pigtail braids. Some sort of raw linen button-down. Funky jewelry. Next: Don't miss our exclusive with Elle Fanning.